L'OCCITANE Count & Win Gift Voucher worth up to RM 600 ! 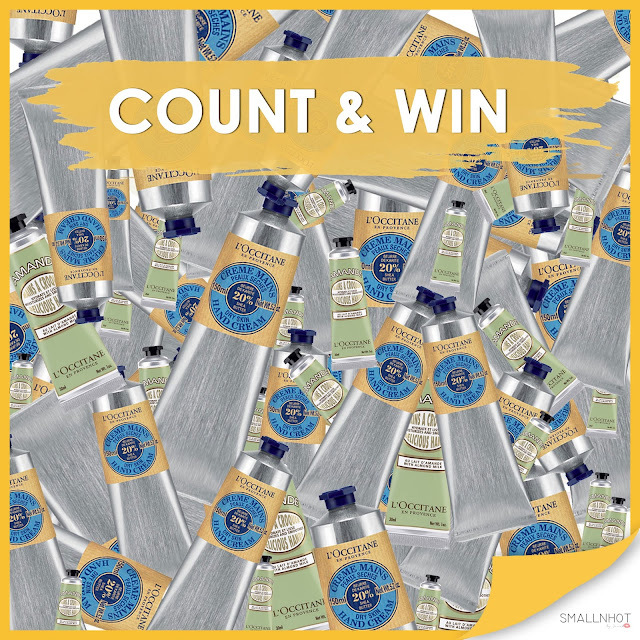 Are you a fan of L'OCCITANE ? If yes, you'll know that L'OCCITANE is a well established French brand that is known for their Shea Butter Hand Creams, Almond Shower Oil, Divine Renewal Skin Program and more. So, Small N Hot has partnered with L'OCCITANE to giveaway gift vouchers worth up to RM 600 for 2 lucky winners. Click HERE and COUNT the Almond Delicious Hands Cream in the photo. TWO winners with the correct answer will walk away with RM 300 L'OCCITANE Gift Voucher each. 1. Giveaway starts from 18 May 2017 - 28 May 2017 (11:59pm). 2. This giveaway it open to all readers. 3. TWO  lucky winners with the correct answer will walk away with L'OCCITANE Gift Vouchers worth RM 300 each per person. 5. Prize will be sent to winners and has to be redeemed at L'OCCITANE outlets in Malaysia Only. 8. L'OCCITANE Malaysia & Small N Hot reserve the right to substitute prize of equal or greater value at any time. 1. Product voucher is strictly for L’Occitane products only. 2. Product voucher is strictly for normal retail items only. 3. Product voucher is strictly not valid with membership card. 4. Product voucher is strictly not valid with any in store promotions. 5. Product f voucher is strictly not entitled for GWP regardless top up amount. 6. One (1) voucher is valid for one (1) receipt only. 7. If purchase amount exceeds the value of voucher, the remaining balance can be paid by cash or credit/debit card. 8. If purchase amount is less than the value of voucher, the remaining balance will not be reimbursed.